Kalaimanokahoʻowaha (also known as Kanaʻina) was an aliʻi high chief of the island of Hawai'i who lived during the period of Captain James Cook's visit and western naming of the Sandwich Islands. He was the chief said to have struck the first blow to Cook when he attempted to kidnap Kalaniʻōpuʻu, the king of the island. He was called Kanaʻina nui ( an aliʻi title) as a birthright from his father, Keaweʻopala, first born son of Alapainui. After his father was killed by Kalaniʻōpuʻu, he would serve the new king as a kaukau aliʻi, a service class of Hawaiian nobility that his mother, Moana Wahine had descended from. This aliʻi service line would continue throughout the Kingdom of Hawaii. Kalaimanokahoʻowaha was the son of the aliʻi nui of the island of Hawaiʻi, Keaweʻopala and Moana Wahine. He was given the nickname ka naʻina which, in the Hawaiian language means: "The conquering". His paternal grandfather was Alapainui and his maternal grandmother was ʻIlikiāmoana. He would have inherited the rule of Hawaii from his father, the usurping ruler but his father was overthrown and killed by Kalaniʻōpuʻu. He would serve under the new kings a kaukau aliʻi. He married his half sister Hakau. Their shared mother was Moana and her father Heulu. Together the couple would have at least two children, Hao (K) and Kiʻilaweau (k). Hao's line leads to Bernice Pauahi Bishop and Kiʻilaweau to Keelikōlani. "Among all of the excitement and confusion two chiefs, an exceptionally handsome six footer named Kanaina and a friendly young man named Palea made themselves useful by ordering canoes out of the path of the ships and stoning the more importunate commoners from the decks". Kanaina had been of help to the foreigners from very early on, even after some mistreatment by the crew of Resolution when the chief had urged a common islander to suggest too high a price for his pig. Many of the other chiefs were less respectful of the newcomers and stole heavily. An islander had grabbed a chisel and tongs and jumped overboard. Cook and James King searched beach under harassment from the townspeople of the Island. Cooks had to make threats of firing his weapon with little success in intimidating the crowds. When Cook was on the beach with the King in hand, a group of islanders began to gather in mass on the surrounding beach. In the melee Cook struck the chief first with his sword. Kalaimanokahoʻowaha immediately seized Cook and held him in his grip when the king's attendant, a lower ranking chief named, Nuaa stabbed Cook from behind. Sheldon Dibble says that Cook shot and killed the man who struck him with a stone and also struck Kanaina, who quickly seized the British Commander. Cook is said to have let out a groan when an islander struck him on the head knocking him to the ground where he dropped and lost his musket. As he was rising, he was stabbed by one of the chiefs. Charles Kanaina was named after the high chief using his nickname, Kanaʻina. The decision to kidnap and ransom the ruling chief of the Island of Hawaii was a fatal error on the part of the British navigator and the main cause of his death. His arrival to Hawaii would be followed by mass migrations of Europeans and Americans to the islands that would eventually end with the overthrow of the Kingdom of Hawaii, the original, native monarchy of the islands. James Cook led three separate voyages to chart unknown areas of the globe for the British Empire. It was on his third and finale voyage that he encountered what we know today as the Islands of Hawaii. He arrived in the islands on January 18, 1778. 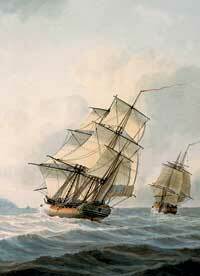 After Cook's initial visit he left but was forced to return to Hawaii in mid February 1779 after a ship's mast broke in bad weather. When Cook had first arrived in the islands he was greeted with great honor. His arrival coincided with the Makahiki, a festival celebrating the yearly harvest while worshipping the Hawaiian deity, Lono. On February 13, while anchored in Kealakekua Bay a small boat was stolen by one of the lesser chiefs, testing the foreigner's reaction to see how far they could go. After he and the crews of both ships, HMS Resolution and HMS Discovery left the islands, the festival season had ended and the season for battle and war had begun under the worship and rituals for Kūkaʻilimoku, the god of war. The Hawaiians had begun openly challenging the foreigners. In retaliation, Cook tried to kidnap the aliʻi nui of the island of Hawaii, Kalaniʻōpuʻu. Cook made several mistakes on his third journey being quite sick and ill-tempered. The hostage attempt would prove fatal. The idea or suggestion that the Native Hawaiians considered Cook to be the God Lono himself is considered to be inaccurate and is attributed to William Bligh through the man's less than qualified opinion. It is possible that some Hawaiians may have used the name of Lono as a metaphor when describing Cook or other possible explanations other than that the Hawaiians mistook the explorer for their own deity. The following morning of February 14, 1779, Cook and his men launched from Resolution along with a company of armed marines. They went directly to the ruling chief's enclosure where Kalaniʻōpuʻu was still sleeping. They woke him and directed him to come with them away from the town. As Cook and his men marched the ruler out of the royal enclosure, Cook himself had hold of elder chief as they walked away from the town towards the beach. Kalaniʻōpuʻu's favorite wife, Kānekapōlei, saw them as they were leaving and yelled after her husband but he did not stop. She called to the other chiefs and the townspeople to direct their attention toward the ruling chief being led away. Two chiefs, including Kanaʻina and the king's personal attendant named Nuaa, followed the group to the beach with the king's wife behind them pleading along the way for the aliʻi nui to stop and come back. By the time they got to the beach, Kalaniʻōpuʻu's two youngest sons, who had been following their father believing they were being invited to visit the ship again with the ruler, began to climb into the boats that were waiting at the shore. Kānekapōlei shouted to them to get out of the boat and pleaded with her husband to stop. The ruler then realized that Cook and his men were not his friends and were not asking him to visit the ship, but forcing him. At this point he stopped and sat where he stood. Cook's men and the British Marines were confronted on the beach by an elderly kahuna who approached them holding a coconut and chanting. They yelled at the priest to go away but he kept approaching them while singing the mele. When Cook and his men looked away from the old kahuna, the beach was now swarmed by thousands of Native Hawaiians. Cook yelled at Kalaniʻōpuʻu to get up but the ruler refused. As the townspeople began to gather around them, Cook and his men began to back away from the crowd and raise their guns. The two chiefs and Kānekapōlei shielded the aliʻi nui as Cook tried to force him to his feet. The crowd was now very hostile. Kanaʻina approached Cook, who reacted by striking the chief with the broad side of his sword. Kanaʻina instantly grabbed Cook and lifted the man. Some accounts state that Kanaʻina did not intend to hit Cook while other descriptions say the chief struck the navigator across the head with his leiomano. Either way, Kanaʻina released Cook where he fell to the ground. As Cook tried to get up, the attendant Nuaa stabbed Captain Cook with a metal dagger. The Marines fired as they fled, killing a number of Native Hawaiians including Kanaʻina and his brothers. They got into the boats and fled back to the ship where, with a spyglass, a young William Bligh (the future captain of HMS Bounty) watched as Cook's body was dragged up the hill to the town where it was torn into pieces in full view of his ship's crew. ^ a b c David Samwell; Ebenezer Townsend (Jr); George Gilbert (1791). Extracts from Voyages Made in the Years 1788 and 1789, from China to the Northwest Coast of America: With an Introductory Narrative of a Voyage Performed in 1786, from Bengal in the Ship "Nootka". Paradise of the Pacific Press. pp. 76–. ^ Index to "The Polynesian Race" by Abraham Fornander. Bishop Museum Press. 1909. pp. 37–. ^ Hawaiian Historical Society Reprints. s.n. 1791. pp. 74–. ^ Kanalu G. Terry Young (25 February 2014). Rethinking the Native Hawaiian Past. Routledge. pp. 54–59. ISBN 978-1-317-77669-7. ^ a b Kanalu G. Terry Young (25 February 2014). Rethinking the Native Hawaiian Past. Routledge. pp. 55–. ISBN 978-1-317-77669-7. ^ Gavan Daws (1968). Shoal of Time: A History of the Hawaiian Islands. University of Hawaii Press. pp. 11–. ISBN 978-0-8248-0324-7. ^ Sheldon Dibble (1839). History and general views of the Sandwich Islands' mission. Taylor & Dodd. pp. 30–. ^ a b albert pierce taylor (1922). under hawaiian skies. pp. 66 and 104. ^ James Cook (1971). The Explorations of Captain James Cook in the Pacific, as Told by Selections of His Own Journals, 1768-1779. Courier Corporation. p. 256. ISBN 978-0-486-22766-5. ^ Janet Susan Holman (May 2008). The Enlightenment and Captain James Cook: The Lono-Cook-Kirk-Regenesis. AuthorHouse. p. 205. ISBN 978-1-4343-6899-7. ^ albert pierce taylor (1922). under hawaiian skies. p. 66. ^ King, James (1784). A Voyage to the Pacific Ocean. 3. London: Printed by W. and A. Strahan. p. 70. OCLC 216557643. ^ Nordyke, Eleanor C. (1989). "Notes & Queries – Kanaʻina and Kaʻiana: Two Chiefs Of Early Hawaiʻi". The Hawaiian Journal of History. Honolulu: Hawaiian Historical Society. 23: 228–230. hdl:10524/556. OCLC 60626541. Kīwalaʻō (1760-1782) was the aliʻi nui of the Island of Hawaii in 1782 when he was defeated in battle and overthrown by Kamehameha I.